- Fast, Clean Pipe Cutting. NG-T-929 NATURE GOLD GARDEN CUTTING TOOL. - With sincerity and hard work of our professionals, we have carved a niche for ourselves in this domain by offering premium quality gamut of Heavy Duty PVC Pipe Cutter. Being an eminent organization in the industry, we are involved in providing a premium quality range of PVC Pipe Cutter. 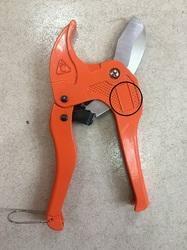 Excellent quality range of Pipe Cutters suitable for cutting pipes of Steel, Copper, Alluminium, Plastic etc. of different diameter. Plastic Pipe Cutting Tool, Size: 1/2" To 1"
Size (Inch): 1/2" to 1"